Untitled painting by Kevin White. Art Enables is an organization in Washington, DC, that focuses on artists with disabilities, giving them the resources and support they need to be visual artists. Their artwork is exhibited and sold at the Art Enables studio, at host venues and on the organization’s website. From October 12-November 1, Art Enables will sponsor the eighth annual “Outsider Art Inside the Beltway” show at its gallery at 2204 Rhode Island Ave. NE in the nation’s capital. 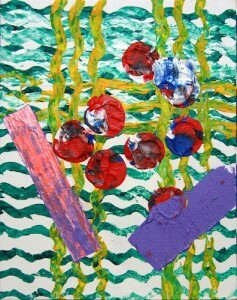 And Arts Access artist Kevin White will have an untitled painting in the show. Congratulations, Kevin! Arts Access gives people with disabilities the freedom to create in the visual, literary and performing arts. This entry was posted in Uncategorized and tagged Art Enables, Arts Access, Kevin White. Bookmark the permalink.